Don't classify me, read me. I'm a writer, not a genre. Recognize yourself in he and she who are not like you and me. One wants to tell a story, like Scheherezade, in order not to die. It's one of the oldest urges in mankind. It's a way of stalling death. Much later in his life he commented that "The United States is very good at understanding itself and very bad at understanding others. " Fuentes also criticized Venezuelan President Hugo Chávez dubbing him "a tropical Mussolini". His politics caused him to be blocked from entering the United States until a Congressional intervention in 1967. 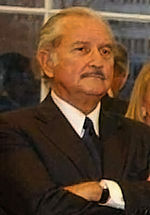 Carlos Fuentes Macías (November 11 1928 – May 15 2012) was a Mexican novelist and essayist. His many literary honors include the Miguel de Cervantes Prize as well as Mexico's highest award the Belisario Domínguez Medal of Honor.